That might not sound like uplifting advice, but in this hilarious collection of stories about mishaps in faraway places, award winning humorist Dave Fox proves otherwise. At age eight, Dave moves to England and nearly starts a riot in Northern Africa. As a nerdy teenager, he smuggles illegal radio equipment into Finland on his way to spending a year in Norway. In his college days, he discovers it is not wise to seek inner peace inside an Icelandic volcano, narrowly misses being stripped, gassed, and robbed (at least in his own head) on an overnight train through Italy, and finds himself surrounded by machine-gun-toting cops in Greece. A few years later, he does something exceptionally reckless. He becomes a professional tour guide. 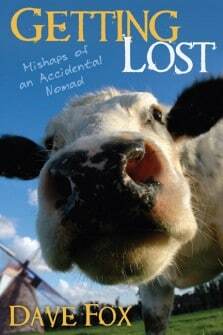 Getting Lost: Mishaps of an Accidental Nomad spans 30 years of adventures and misadventures overseas, from Dave’s year as a British school boy, to his teenage days as a foreign exchange student, to his so-called “adult life” as a professional traveler. He weaves together tales both poignant and amusing in this memoir of a travel-obsessed geek.